-Lemons, apart from tasting great with soda water, are also really useful for shining up a steel sink. They’ll obliterate water marks in no time. Just dry with a cloth when you’re finished. -When the sink gets clogged, you don’t need to buy drain cleaning solution. Just mix together baking soda and salt, pour it onto the blockage, and add vinegar. Hot water will drain the gunk away when it’s done. 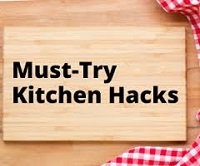 –Get rid of the burned bits on toast or anything that you’ve baked by using a cheese grater.